I’ve seen it happen on more than one occasion, riders attempting to make emergency stops with all sorts of detrimental errors. I’ve seen them lock up the rear tire severely and end up sliding across the pavement in an avoidable low side. I’ve seen them lock up the front tire, wobble dramatically from side to side and end up sliding across the pavement. I’ve seen people freeze, barely get on the brakes at all, and end up hitting the very thing they were trying to avoid. I’ve even witnessed a rider grab the front brake so hard and for so long that he rose up into a massive stoppie with the bike continuing to gain altitude until it was flipping over on top of him. All of these errors are avoidable and with a little bit of rider education and training, emergency braking can become a well-learned and well-executed skill. Lets talk first about locking up the rear tire. It’s easy to do. It doesn’t take much pressure on the lever to get it to lock up and in most cases can cause unnecessary problems. With a locked up rear tire you lose valuable traction and the back end has a tendency to fish tail, or skid violently to one side or the other. Less pressure on the rear brake will help prevent this from happening, and if you do lock it up, just let off the pressure gently until it is no longer locked. Don’t stomp it on, and don’t suddenly release it. Many riders have experienced to some degree locking up the rear tire and are somewhat comfortable with it. Locking up the front tire on a motorcycle however is much more elusive and therefore when it does happen can be terrifying. 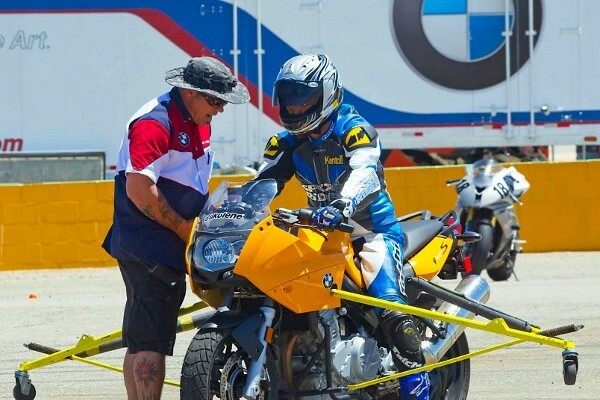 At the California Superbike School we have a bizarre looking motorcycle in the fleet of specialized training bikes, a BMW F800S that has long yellow poles sticking out of the sides. The poles have small skateboard wheels on the ends of them and are designed to act a bit like training wheels. 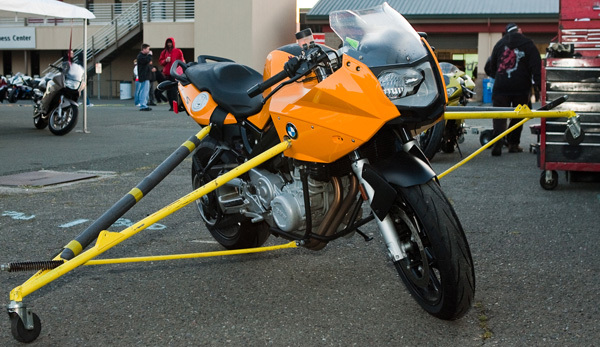 They prevent the bike from tipping over, and crashing in a low-side and therefore provide extra confidence for students that are learning about emergency braking. 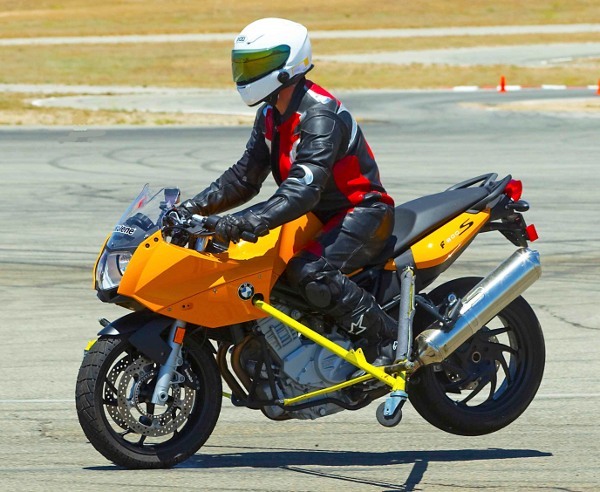 The idea behind the Panic Brake Trainer, designed by Keith Code and offered during all two day camps, is to allow students to experience a fully locked front wheel and then be trained to save it. The panic brake exercise allows students to experience front wheel lock up. During the exercise students get the bike into second gear, approximately 25-30mph and then get on the front brake as if they were trying to avoid hitting something. From there we coach them on progressively pulling the front brake lever until the front wheel locks. When the front locks it often makes a loud chattering or skidding noise and sometimes a puff of smoke rises off the wheel. 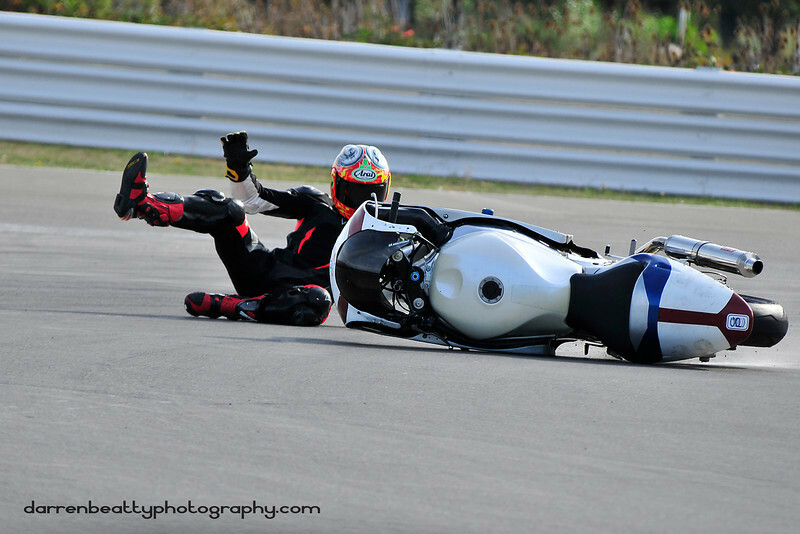 The tendency, when this happens to the rider, is to either let off the brakes completely which most often results in them hitting the very thing they were trying to avoid, or to keep the same amount of pressure on the brake lever, which continues the front wheel skid and usually results in a low side crash. Most have never felt this sensation before so they panic and don’t know what to do. When our students finally lock up the front we coach them to come out of the brake a little bit, nice and gently, to the point where the front is no longer locked. This way, they continue to come to a stop but will no longer be testing traction with a locked front wheel. Most students find this exercise very valuable for two distinct reasons. One, they get to see how much pressure it takes on the lever to get the front to lock up,(usually a lot more then they ever thought) and two, they get to practice locking up the front and then saving it, without fear of crashing the bike. Most are surprised by just how much front brake they can apply without actually locking up the front tire. Other things that will help make braking smooth and problem free include lever squeezing technique and body position on the bike. 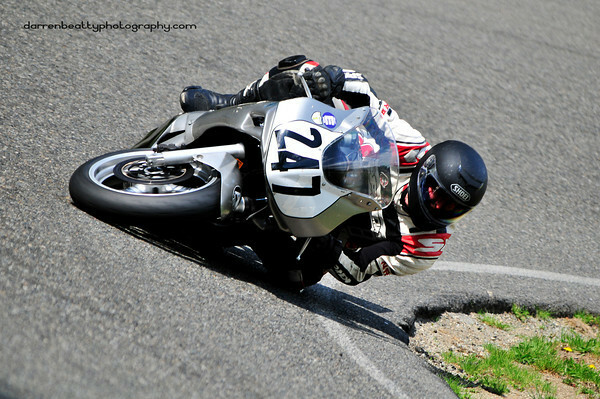 I usually recommend using two fingers on the front brake lever and pulling with smooth and progressive pressure. Avoid snatching the front brake or squeezing hard and fast at the end of braking. Also, avoid having super stiff or straight arms as you will transfer that pressure into the handlebars and can initiate a wobbling back and fourth that could turn into a tank slapper. Pinching the tank with your knees will help to keep the weight off your arms, and will also keep your body weight from sliding forward suddenly. When you do find yourself in a situation of having to emergency brake, try to avoid target fixing on the object that you are trying not to hit. Focus on the braking and on seeing the available space around you that you could utilize. If you are able to brake safely and come to a complete stop then do so, if you think you are not able to brake hard enough to avoid the situation then you could brake hard to scrub off speed, release the brake completely and then quick steer around the problem. Don’t try to steer the bike with any amount of brake on. Lastly, even though stoppies look cool, having the rear wheel in the air is not the safest way to come to a stop. A lot of people accidentally end up with the rear wheel lifting off the ground because they squeezed the brake lever harder at the end of their braking, almost like a little stab, and they let their entire body weight slide into the tank which puts too much weight forward, lightens the rear and results in a reverse wheelie. Squeezing the tank, relaxing the arms and pulling the brake in smoothly and evenly will help prevent this from happening. This is one riding skill that can be practiced in a parking lot or empty side street. Start slowly and work on squeezing the brake lever smoothly and consistently and come to a complete stop. Then try to pull the lever a little harder and stop a little quicker. It pays to have at least practiced this skill a few times so that if you do suddenly find yourself in an emergency braking situation, you are better able to handle it. Keith Code on Trail Braking- Exclusive Interview Tips for Riding in the Rain The Limit: Exploring Front Tire Traction What’s a Tankslapper? Hi Misti, I am happy to find your site, its been enjoyable to read through several of your articles and I have added it to my favs. I was curious if you could help me with a problem I have experienced and cant seem to work out what happened. I test rode an MT09 (FZ09) which is known for soft suspension. On a braking test (70km/hr -0km/hr) I experienced some serious rattling of the forks. I am guessing this was perhaps a lock of the front wheel or something to do with the suspension (bottoming out?). The road this occured on was flat and so the rattling was definitely a shock to me. Have you experienced anything like this and perhaps could you shed light on what happened and how I can prevent it happening again. I sent you an email which I hope will answer your question. Let me know if you have any more 🙂 Cheers!